The George Bairstow Cake Bake! During the week of 15 May we’re inviting all our supporters to join our new event, the GBCT Chocolate Brownie Chat. 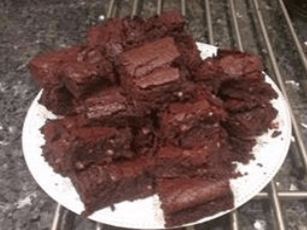 Chocolate brownies were a favourite of George’s and he even had his own special recipe, so it seems appropriate that a chat over a brownie is how we spread the word about GBCT further. Our aim is to continue to support the increase in volume and variety of grant applications we’re receiving, so we can continue to expand the support we provide to communities. It would also be great if we could raise some money for GBCT too. Is it easy to do? Yes, it’s simple. Bake, or buy, some chocolate brownies and share them with your friends and / or colleagues. Either give them out or leave them in a communal area. Whilst they’re being enjoyed have a chat about GBCT and spread the word. What will I say about GBCT? We all have our own stories about why GBCT is important, but we’ve also got a handy information leaflet you can use too. From the links below you can download our GBCT leaflet, event poster / template and a copy of our latest newsletter. We’d recommended printing a copy of each and leaving them next to your brownies. Would you like to hear about my event? Yes please! We’d love to see some pictures, either via our Facebook, Twitter (#GBCTBrownieChat) or via email to info@gbct.org.uk.